Palestinian director Hany Abu-Assad (who was nominated for an Oscar for suicide bomber drama Paradise Now) is no stranger to tackling the Israel-Palestine conflict, with invectives, head on. He is, however, a director trying to make his films increasingly more accessible to an audience outside of his immediate political lexicon without pulling any emotional punches. Omar, despite taking place within the West Bank and having a distinctive perspective on the issue, attempts to branch out to include universal human conflicts, such as trust and the complex nature of psychological coercion. 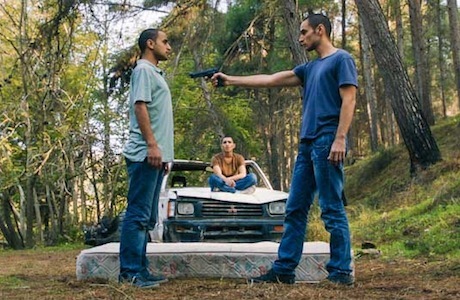 Though the villains remain relatively archetypal, presented as Israeli soldiers and agents, the inherent conflict and emotional impetus of the film stem from the relationship Omar (Adam Bakri) has with his immediate group of friends, which, incidentally, the Separation Wall estranges him from. Early, as we're being introduced to Omar and his friends, Amjad (Samer Bisharat) and Tarek (Eyad Hourani), the story presents itself as a forbidden romance. While working as a baker, Omar routinely risks his life, scaling the Wall to visit Nadia (Leem Lubany), the younger sister of Tarek, despite keeping it a secret and saving up money to eventually ask her father for permission to marry. This story is promptly interrupted by an incident with Israeli soldiers where Omar is interrogated and beaten on the side of the road, leading to an act of vengeance — the shooting of the soldier — that escalates, changing everyone's lives forever. That Omar is initially an occasionally comic romance turned on its head by irrational violence isn't a mistake. The intrusion of the military element on otherwise unobjectionable lives is subtext unto itself. Similarly, the eventual torture and exploitation of Omar by Israeli agents — having him spy on his friends in order to live — are representative of the sort of psychological environment and emotional duress omnipresent in the lives of those in the occupied West Bank. Abu-Assad, having honed his ability to craft a compelling narrative, fares well with his actors and action, having an assured sense of composition and a knack for capturing reactions. It helps compensate for some of the tonal awkwardness that transpires early on when the violence is handled with such a cavalier attitude. That said violence is part of the quotidian is obvious and understandable, but the severity of it is often diminished by an indifference and lack of stylistic transition between casual conversation and flat-out murder. What's most effective is the eventual breakdown amidst the friends. Nadia and Amjad are immediately suspicious of Omar once he returns from Israeli detainment. He claims they didn't have enough evidence to hold him, but they have a feeling he's been enlisted as a spy. This doubt, and the strain it puts on their relationships, is what universalizes the story, playing with the notion of camaraderie in relation to an unreliable political environment. Smartly, this interplay amidst friends forced to question their loyalties isn't all Abu-Assad is interested in. Gradually, he reveals secrets to specific characters, seeing how all of them will react, eventually showing that the underlying story is even more complex than Omar imagined. It all holds up well to scrutiny, but the limited stylization and tendency to have the characters tell what they're feeling rather than show leave this psychological drama possessing less ire than it easily could have.